The AfDB Statistics Pocketbook 2017, presents summary economic and social data on regional member countries and on the operational activities of the African Development Bank Group. Most of the indicators shown are selected from another Bank publication: Compendium of Statistics on Bank Group Operations, Gender, Poverty and Environmental Indicators on African Countries. The AfDB Statistics Pocketbook 2016, presents summary economic and social data on regional member countries and on the operational activities of the African Development Bank Group. Most of the indicators shown are selected from another Bank publication: Compendium of Statistics on Bank Group Operations, Gender, Poverty and Environmental Indicators on African Countries. The AfDB Statistics Pocketbook 2015, presents summary economic and social data on regional member countries and on the operational activities of the African Development Bank Group. Most of the indicators shown are selected from an other Bank publication: Compendium of Statistics on Bank Group Operations, Gender, Poverty and Environmental Indicators on African Countries. The AfDB Statistics Pocket Book 2015 was prepared in the Economic and Social Statistics Division of the Statistics Department at the African Development Bank. The AfDB Statistics Pocketbook 2014, presents summary economic and social data on regional member countries and on the operational activities of the African Development Bank Group. Most of the indicators shown are selected from an other Bank publication: Compendium of Statistics on Bank Group Operations, Gender, Poverty and Environmental Indicators on African Countries. The AfDB Statistics Pocket Book 2014 was prepared in the Economic and Social Statistics Division of the Statistics Department at the African Development Bank. The AfDB Statistics Pocketbook 2013, presents summary economic and social data on regional member countries and on the operational activities of the African Development Bank Group. Most of the indicators shown are selected from an other Bank publication: Compendium of Statistics on Bank Group Operations, Gender, Poverty and Environmental Indicators on African Countries. The AfDB Statistics Pocket Book 2013 was prepared in the Economic and Social Statistics Division of the Statistics Department at the African Development Bank. The AfDB Statistics Pocketbook 2012, presents summary economic and social data on regional member countries and on the operational activities of the African Development Bank Group. Most of the indicators shown are selected from an other Bank publication: Compendium of Statistics on Bank Group Operations, Gender, Poverty and Environmental Indicators on African Countries. The AfDB Statistics Pocket Book 2012 was prepared in the Economic and Social Statistics Division of the Statistics Department at the African Development Bank. The AfDB Statistics Pocketbook 2011, presents summary economic and social data on regional member countries and on the operational activities of the African Development Bank Group. Most of the indicators shown are selected from the other Bank publications: Compendium of Statistics on Bank Group Operations, Gender, Poverty and Environmental Indicators on African Countries and Selected Statistics on African Countries which contain more detailed information. The AfDB Statistics Pocket Book 2011 was prepared in the Economic and Social Statistics Division of the Statistics Department at the African Development Bank. The AfDB Statistics Pocketbook 2010, presents summary economic and social data on regional member countries and on the operational activities of the African Development Bank Group. Most of the indicators shown are selected from the other Bank publications: Compendium of Statistics on Bank Group Operations, Gender, Poverty and Environmental Indicators on African Countries and Selected Statistics on African Countries which contain more detailed information. The AfDB Statistics Pocket Book 2010 was prepared in the Economic and Social Statistics Division of the Statistics Department at the African Development Bank. The AfDB Statistics Pocketbook 2009, presents summary economic and social data on regional member countries and on the operational activities of the African Development Bank Group. Most of the indicators shown are selected from the other Bank publications: Compendium of Statistics on Bank Group Operations, Gender, Poverty and Environmental Indicators on African Countries and Selected Statistics on African Countries which contain more detailed information. The AfDB Statistics Pocket Book 2008 was prepared in the Economic and Social Statistics Division of the Statistics Department at the African Development Bank. The ADB Statistics Pocketbook 2008, presents summary economic and social data on regional member countries and on the operational activities of the African Development Bank Group. Most of the indicators shown are selected from the other Bank publications: Compendium of Statistics on Bank Group Operations, Gender, Poverty and Environmental Indicators on African Countries and Selected Statistics on African Countries which contain more detailed information. The ADB Statistics Pocket Book 2008 was prepared in the Economic and Social Statistics Division of the Statistics Department at the African Development Bank. The ADB Statistics Pocketbook 2007, presents summary economic and social data on regional member countries and on the operational activities of the African Development Bank Group. Most of the indicators shown are selected from the other Bank publications: Compendium of Statistics on Bank Group Operations, Gender, Poverty and Environmental Indicators on African Countries and Selected Statistics on African Countries which contain more detailed information. 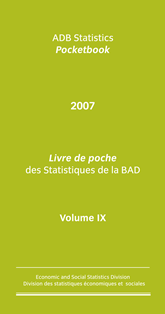 The ADB Statistics Pocket Book 2007 was prepared in the Economic and Social Statistics Division of the Statistics Department at the African Development Bank. The ADB Statistics Pocketbook 2006, presents summary economic and social data on regional member countries and on the operational activities of the African Development Bank Group. Most of the indicators shown are selected from the other Bank publications: Compendium of Statistics on Bank Group Operations, Gender, Poverty and Environmental Indicators on African Countries and Selected Statistics on African Countries which contain more detailed information. The ADB Statistics Pocket Book 2006 was prepared in the Economic and Social Statistics Division of the Statistics Department at the African Development Bank.